Don’t puff, puff, pass on these weed stocks. Pot stocks are making a comeback after a few months of distribution. 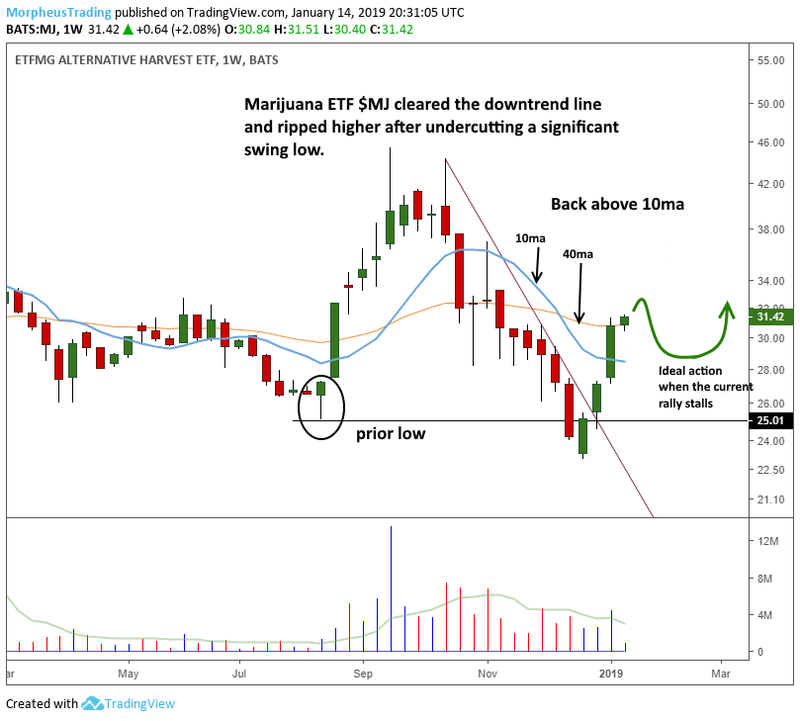 Marijuana ETF $MJ is up +30% after undercutting a prior swing low last December. The weekly chart is back above the 10-week moving average (10wma) and is attempting to clear the 40-week moving average (40wma). The big run up off the lows is a great start, but the price action is a bit too volatile to produce a low-risk entry point for an intermediate-term trade. In order to produce a legit buy point, $MJ would first have to form some sort of base of four or more weeks that doesn’t give back much more than 40% of the last rally off the lows. During the base, volume should dry up while the 10-week MA begins to turn up. Nice reversal, but nothing to do right now. 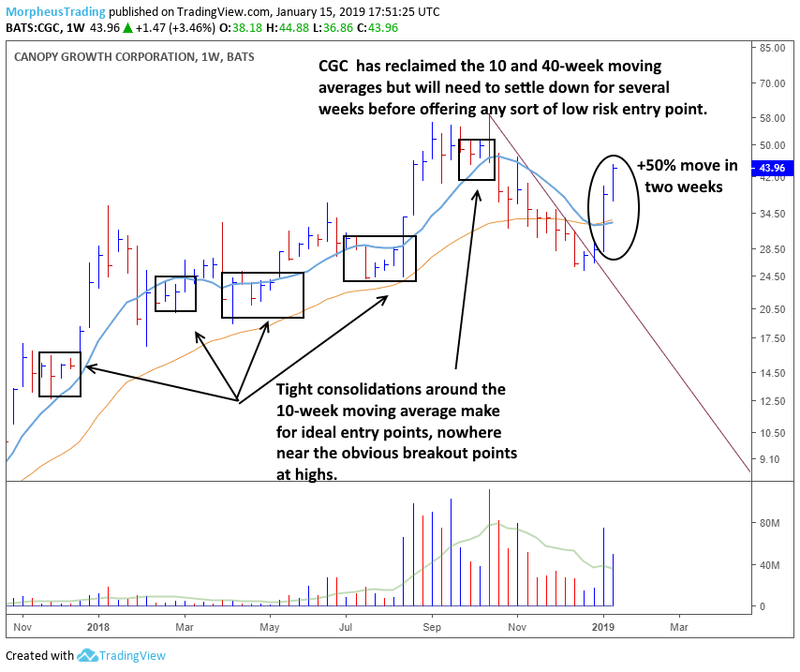 Let’s take a look at a few of the more active marijuana stocks, starting with $CGC, which is nowhere near a buy point after a +50% move off lows the past two weeks. In general, any tight price action near a 10-week moving average within an uptrend has the potential to produce a very low-risk buy point. $CGC is strong, but nothing to do right now. 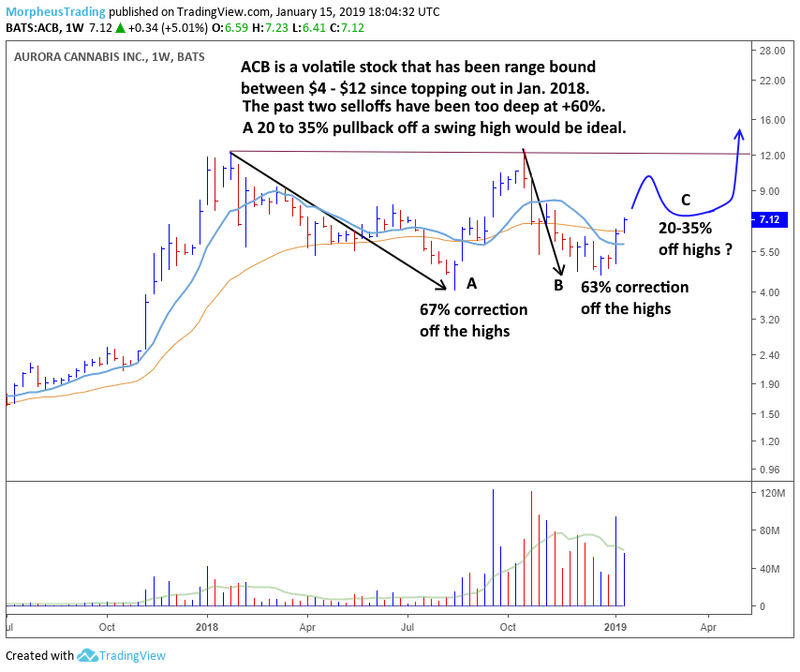 $ACB is also not in play right now, but the weekly chart is worth monitoring for a tight consolidation to form in the $7 to $12 area. A move out from a valid basing pattern could lead to a breakout from a year long trading range down the road. 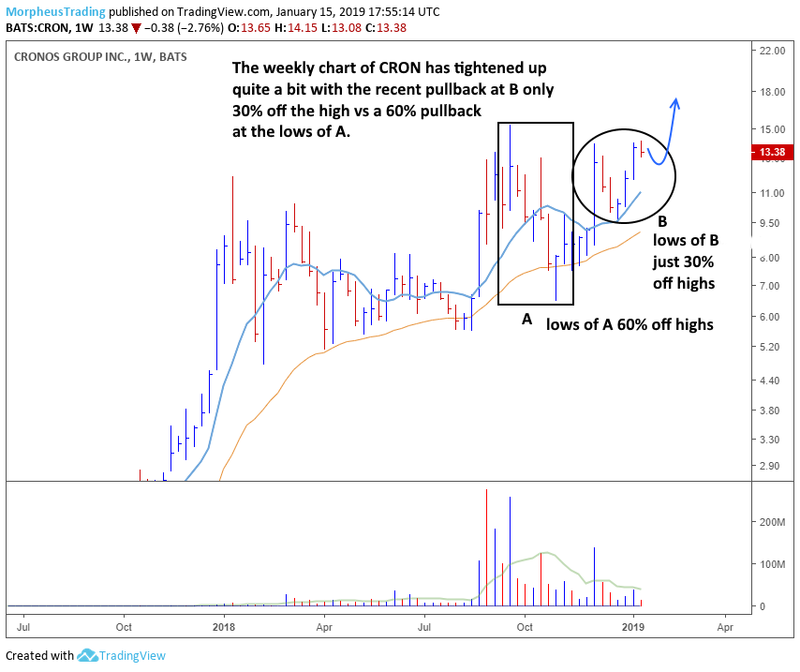 $CRON is the only liquid stock within the group that is potentially near a valid entry point for an intermediate-term trade. $CRON isn’t near the 10-week MA, but it has formed a cup with handle like pattern circled on the chart below. The weekly chart has tightened up quite a bit, with the lows of the last correction only 30% off highs (B) vs 60% at point A. A breakout from this pattern could lead to an explosive rally at new highs with no resistance in its way. $CRON should be monitored closely for a breakout entry within the next few weeks. Do you want more awesome trading tips and industry insights? Sign up for The Wagner Daily Newsletter today!